Helping us to reach this milestone, were 3 newcomers - Tony and Geert (Dutch friends of Johan's), whilst Rob decided to bring his wife, Katarina along too. Within a small pizza kitchen in Isleworth, four brave and intrepid chefs sat down to spin their bases and sprinkle the toppings to make the most admirable pizzas of all time. Alas, the chef named Ian was wary of this game, as once before he had failed to create enough recipes to satisfy his customers. Scott and Stephanie were confident, but by no means cocky, that they would be able to satisfy the meanest palates. And the fourth chef, Dan, had no idea what to expect as this was his first time to cook even the plainest of pizzas. He learned quickly, however, and by the end of the first round, both he and Ian had amassed two complete recipes, while Scott and Stephanie, the more experienced chefs, had only managed a puny and pathetic one each. The second round was particularly devastating for Stephanie, who managed only one recipe, despite having started the round. Ian was racking up pizzas like nobody's business, flour and cheese flying around his kitchen with the rapidity of a fox-harassed chicken. Dan and Scott climbed the ranks to three pizzas apiece, and then, with Stephanie having once again selected the mamma-mia card, the third round began. The intrepid chefs threw themselves into the final battle with gusto. The middle deck began with a healthy cupboard of mushrooms, chillis and olives, though pineapple and pepperoni were in short supply. One by one, recipes were thrown into the ring - an olive pizza here, an olive pizza there, a chilli for good measure, how about a one of each? 15-ingredients, 15-ingredients, 15-ingredients!! ... and finally, the final ingredient card was lifted and the time came to deal. Ian and Stephanie both shone this round ... Stephanie picking up two recipes with ease, and Ian with a little more effort from his own hand, but secure in his future win, already having many recipes under his own belt. Scott found his way to another pizza, as did Dan, but for Dan, the true disaster had struck. With a base ingredient of chilli, the truth soon became known. "I didn't draw a single chilli that round." This is devastating for any chef, as the base ingredient is the critical ingredient to all-but-one of the eight recipe cards. But for this chilli, the brave new chef would have pulled at least two or three extra recipes under his belt. But that was that - the closing bell rang throughout the kitchen as more intrepid gamers walked through the door. Ian had won with six recipes, Scott and Stephanie had tied with four recipes and four ingredients each, Dan had come last with a still admirable score of four recipes and three ingredients. As the game closed, Ian had but one thing to say - "Well, it wasn't so bad that time." They then decide where to place it on a table, and depending where they place it, and whether their dice are still there when their turn comes around again, they move along a certain number of spaces on a track. The higher you place it, the more spaces you move, but the more likely that someone else will knock you off in the meantime. Both dice have an ‘X’ on them (hence the name of the game), and a roll of either of these ends your turn immediately. Doubles result in an instant move forward and another roll. Although Paul seemed like a nailed-on winner, towards the end of the game everyone bunched up and a couple of good rolls would have seen anyone arrive home first. As it was, Mr Lucky-Pants rolled 2 more doubles to cross the line first. Emma also rolled a double to finish second, whilst Iain was still seeing more X’s than a ballot box, to creep in last. The game is about taking tricks - the deck consists of four suits of cards running from 2 to Ace (Ace always being high), with the suit having no relevance other than its colour for straight flushes. The twist to the game is in the 4 special cards - there is a sparrow with value 1 which starts the round and can make a wish for a particular card to be played if possible, the phoenix which is a joker, the dragon which is the highest card but can only be played on its own and a dog which passes the lead to your partner. When leading a trick you can play a single, pair, triple, sequence of any number of pairs, a straight with a least 5 cards or a full house, everyone else must follow the same type of cards led (including the number of cards if it’s a straight), so if you start with a pair, only a better pair can be played on top of it unless you have a bomb as they can be played on anything. A bomb is a four of a kind or straight flush of 5 or more cards. The aim of the game is ideally to empty your hand of cards first, this doesn’t score you anything necessarily but if you called “Tichu” before you had played your first card of the round, you would score 100 points for your team, but if you fail, you lose 100 points instead. Other scoring happens for 5s (+5), 10s (+10), Kings (+10), the Phoenix (-25) and the Dragon (+25). However if you and your partner finish 1st and 2nd you score 200 points (plus 100 for Tichu if called) instead of scoring cards for either team. So Scott taught those rules as best he could and we played a practice round to ensure everyone knew what they were doing. Ian still looked a little confused but I’m beginning to think that’s his normal look during new games… Everyone seemed happy so we began the first round. Gareth and Steph got off to a good start after Scott called a “Tichu” and they easily avoided him finishing first by Steph having an unexpected bomb which Ian and Scott had inadvertently contributed towards (you pass a card to each player before starting the round). Scott’s hand was kind of expecting to keep the lead and so it died in the water. After the 1st round it was -90 I+S, +90 G+S. Rounds 2+3 were more cautious from Ian and Scott, (especially Scott), but Steph and Gareth were much more confident in calling Tichu – although they failed them both too; one was possibly due to a rules misinterpretation by Gareth in how many pairs you could play in a sequence - it being unlimited rather than just two which worked in Scott’s favour. It was also rather surprising considering the number of bombs Gareth managed to scrape together. Two more rounds resulted in -150 for G+S and +150 for I+S. It looked like it may take forever for us to get to 1000 and so we called it a day. To be played again with more time committed to it..
After some debate, it was agreed by a group of five to play Lexio and then Chicago Express - this satisfied those who wanted something fun and light and those who wanted a more "meatier" game. Emma had played Lexio last time and enrolled Steph; Paul and Iain stayed to play Chicago Express afterwards. The rules were explained quickly and at the offer of a practice round (rounds play quickly so it would be no hardship) Iain declared something along the lines of practice rounds were for wimps. How he regretted those words a few minutes later! The first round was played and Steph had a great hand, playing all her tiles out quickly once she had the lead. Fortunately, most of the rest of us had played many tiles ourselves but not Iain, who also had a "2" tile in his hand which doubled the points he had to pay all the others. It was a round his score did not recover from. The four remaining rounds played quickly with the occasional rule clarifications on the way but no one was able to get a truly "knock-them-dead" hand to match Steph's first round hand. Steph and Emma both wanted to play again right away but a deal was a deal and it was time for Chicago Express although Lexio will no doubt be on offer again next week. Jim 204; Steph 171; Paul 166; Emma 166; Iain 48. Following on from a suggestion that this game would be much more interesting playing the Overlord variant, Dan stepped in to take on this evil role. The game was new to Rob and Katrina, but is easily explained, and being a co-op, is very forgiving. Dan started off by focussing on one coloured segment (blue), which was a good strategy, topped off by a couple of well-timed boulders which decimated 2 of the towers. Things were not going well for the defenders, but, as is the nature of this game, they somehow managed to hold things together for long enough to be able to rebuild some of the walls and bring some semblance of order to proceedings. Optimism was rising as the bag slowly drained of tiles, but with a knowing smirk, Dan revealed the ‘+4’ and ‘+3’ monster tiles in 1 turn. This was enough to take out the penultimate tower, but there was still hope…until Tonio decided to focus on becoming the Master Slayer and played a “Nice Shot”+ archer, rather than a knight, resulting in the castle being finally over-run. Two very different games were played. The first game was with four people (Maynard, Tony, Geert and Johan) out of which three players had never played before. The game itself was fairly uneventful apart to say that the RA tiles came far too quickly! The newbies got the game quickly though and in the second epoch people were beginning to play more strategically. This however was the ‘warm-up’ game, to test the waters and the game itself. The second game, Geert was getting a beer and wanted to see some other games played at the other tables, so Tony, Maynard and Johan played a three player game. This played quite differently and as Tony and Maynard got into the swing of things Johan’s first and second epoch were abysmal, scoring only 4 points. He did however have the three highest numbers in the last round, which gave him some control. This is where the tricky bit of the game was played. Johan picked up all that he thought he should / could get, and was the first out of the last epoch. Tony and Maynard still had a buffer of 3 RA tiles still to turn up before the game was over, but alas, the first two tiles were drawn in the next three goes and Tony was the last one playing on his own. He started drawing the first seven tiles successfully, but the inevitable last tile was indeed the downfall! This meant that he had little success in acquiring points and Johan was declared winner. Sometimes luck is just what you get when you need it. Johan 49; Tony 42; Maynard 36. Paul was well up for it for his ‘heavy game’ of the evening. Jim seemed less keen but went along for the ride. However, as soon as the foam pistols of Cash & Guns were mooted on the next table, Steph and Emma whooped with joy and ‘yee ha’d’ away for some barrel-pointing fun. The game itself is pretty simple, but takes a bit of explaining. Once Iain had managed to walk Jim and Paul through it, the game started. In the first auction Paul and Jim decided that it might be fun to spend the cash they had buying shares in all the railroads, whilst the canny Iain held back (let’s not forget whose game it is). Iain didn’t push home his tactics of buying up in the next auction phase though, as he felt guilty at having the advantage. The game played out pretty smoothly with a nice balance swinging from one railroad company to the next, with the Pennsylvania Railroad company (red) being the cash cow at the start, only to be thoroughly ignored once all ‘investors’ had equal shares and there was nothing to be gained from expanding it. The ‘Baltimore and Ohio’ and ‘New York Central’ companies both had their share of boom times, with Chesapeake dragging its feet for most of the game. Jim went for the more southerly routes, Paul bought up in those companies at the top of the board and Iain investing wherever he saw fit. Paul’s strategy was to accumulate as many shares as possible, although had a nagging doubt that he probably shouldn’t be because Iain wasn’t. Jim was lagging a bit but then at the end of the game managed to get a monopoly on the latterly introduced Wabash company, which he managed to maneuver into some nifty points-earning positions. Overall, the checks and balances on the game came into play extremely well and it was worthy of it's 'BGG top 100' rating. 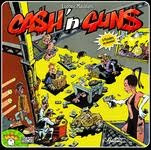 At the end it turned out that Paul’s mad buying did surprisingly yield the best dividends, with Iain’s wise old head managing second place, whilst Jim’s Wabash effort was a little too late - his longing looks to the Cash & Guns table told a forlorn tale. Steph and Emma were very excited about playing this one, and after a few rounds it was easy to see why people find it such a fun game (although I’m not sure that Tonio would agree…..) In the first game, the newcomers were feeling their way into it – a disproportionate number of guns were aimed at Jon, but in the absence of Gareth I suppose that was to be expected. However, it all went pear-shaped in the penultimate round. Dan and Jon had a Mexican stand-off which resulted in 2 dead Mexicans. At the other end of the table, Tonio also refused to duck when faced with 3 guns, assuming that they contained blanks. Unfortunately, they all turned out to be loaded, and he perished in a hail of lead. As it turned out, Rob had avoided the most bullets and purloined the most swag to win the game. Continuing with the game of the month, Barrie and Gareth (the experts) were joined by Ian and Scott (the newbies). Gareth did a good job of explaining the rules (honestly), even with a couple of confused looks and reiterations required, but there was a nice looking and descriptive player board that had the costs and points you can earn listed on it, so that was a good reference point during the game. Gareth and Scott were discussing the game before it started - all Scott knew about it was that you should ‘buy Jesters’ as recommended on BGG as they score on every type of work and so are quite valuable. Gareth announced this to the table before we started, just so we were all on the same page (and probably so that Gareth wasn’t the only one to watch out for Scott – although people should be doing that automatically by now anyway) but they didn’t get played too early in any case. The first few rounds seemed to be spent building up your board rather than scoring very much and Gareth and Ian took the early lead while Scott and Barrie spent a bit more time focussing their plans. By the middle of the game it would appear we were playing a rule slightly wrong. Gareth had paid money to play one of his works and Scott enquired why he was paying when there isn’t a cost for it on the player board. “Oh” he said (you’ve all heard how it goes) and despite having paid the most money incorrectly he suggested we just play on. However, as Scott had wisely been following the costs on the board and not paid any for them, everyone else took the necessary money back. Scott and Gareth were now starting to recruit some Jesters and the costs each round were getting higher with the highest bid from Gareth of 700 florins. Ian was going down a builder strategy and getting plenty of buildings for free, but was running low on works to play towards the end to gain some large point bonuses. It appears the curse Barrie put on Ian at the start was coming true, as anyone going into an early lead was usually trailing by the end. Scott and Gareth continued with their Jester strategies and Gareth took the edge with a third to Scott’s two and looked like this could carry him to the win, but a last-turn works scoring less than Scott’s brought it very close. However, Barrie had been sitting quietly (figuratively speaking) on the sidelines waiting for his time to strike. Having acquired the most bonus cards and most prestige cards (end game scoring) he pulled off the best work of the game in the last round worth 26 (13 VP). Approaching the very end, Scott had managed to accrue a 10 point lead over Gareth and Ian who were around the same, and Barrie a little further back; Gareth had a scoring card taking him up to just 3 points behind and Barrie had two high scoring cards rocketing him up the scoreboard to just 2 points behind Gareth, leaving poor Ian in last, but a fairly close result overall. It was a very enjoyable game, deserving of its place high up in the BGG rankings, with scope for very strategic play and more intense auction rounds when people have a better idea of how to value items. end of the game. Barrie and Ian were somewhere in the middle having a more even collection of both. The game moved at a quick pace and it wasn’t long before the building deck was nearly exhausted. Using his Observatory, Gareth took the last building card to initiate the final round, concerned by the number of points Scott was gaining from his buildings each round. This took the others by surprise and there were frantic actions trying to offload any cards in their hands to avoid minus points. New to Katarina, Geert and Tony, it was quickly explained and underway. The first round was with 7 players, but only 1 saboteur. This turned out to be Geert, which is a rough deal on your first game. He turned out to be a little too subtle and the good dwarves triumphed. The rest of the Dutch contingent then joined in for round 2, making a total of 9, but with only 2 saboteurs this time. This round started with Maynard playing an innocuous-looking card, only to have a tool immediately broken by Rob. Never has such a look of bewilderment and annoyance crossed the face of the mild-mannered Maynard, but as it turned out, Rob had obviously got some sort of sixth sense as Maynard was later revealed to indeed be one of the saboteurs. Spooky. The final round saw Dan and Tony being the flies in the ointment, but to no avail. It was a clean sweep for the good guys, with Jon taking the most spoils for himself. It was unusual that all 3 rounds had 1 less saboteur than the possible maximum, and this really does make it tricky for them – especially as 3 of the 5 fell to our newcomers. All good fun to finish the night off though. Thanks to everyone for turning up tonight, and we look forward to reconvening at the same time, same place in 1 week's time. Cheerio!